Well, it’s not all new – it includes quite a few elements seen previously here, but is an attempt to make some kind of definitive document. It also includes a lovely new animation by Ben Dobson. It’s not quite finished yet – needs a few tweaks towards the end, and I want to improve the sound. Version 2 to follow shortly! me and my shadow is over now, sadly; but I’m already looking forward to me and my shadow 2 – more anon! In the meantime I’m gathering some documentation, feedback and so on. 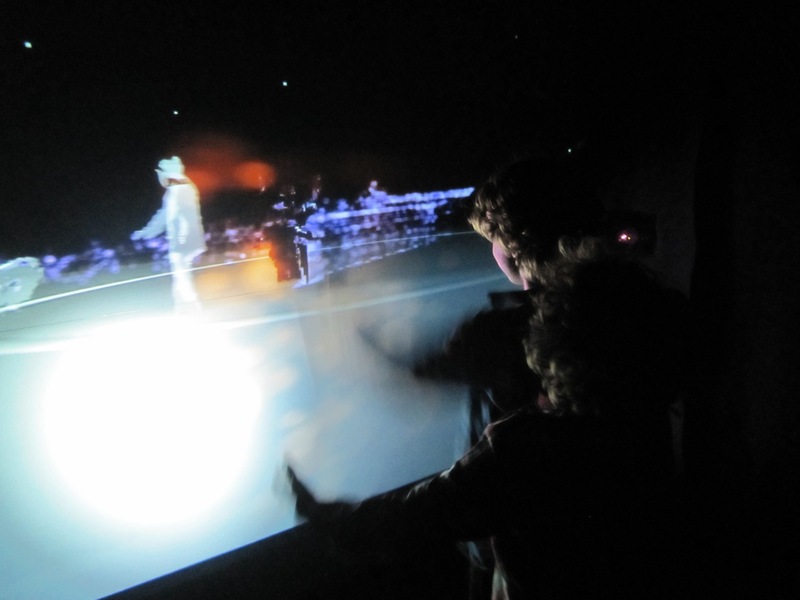 We’ve been getting some great feedback on the project – I’ve made a new Feedback section to gather some of this, including a very nice ‘vox pops’ video that the National Theatre put together. Above are a couple of videos that I’ve made showing the portals in action, and below a small selection of the many, many photos I’ve taken over the last week of setup, the launch and the first week of running. It’s been a whirlwind few days – I haven’t had time to post, and really I’m too tired now. However, I had to at least let you know that we’re up and running. I’ve been back in London, and we were working frantically right up until the launch, but then everything has gone super smoothly for the launch and the first two days of operation. Phew! I’ve been very happy with it, and we’ve had some great feedback from visitors. Come and have a go – details are, as before, in the PREMIERE section (see above). If you can’t physically make it to one of the portals, then you can see an overview of the realtime virtual space HERE (do bear in mind that this is realtime, so if you log in when the portals aren’t open, you won’t see much). I’ll post more very soon! Sorry I haven’t had time to post much over the last week – coordinating the four installations in four countries has been very complex. It’s been very hard work for the partners in each country too – I really appreciate everyone’s hard work in this final push – it will be worth it! Again, if you’d like to visit one of the portals, check out the details in the PREMIERE section. The premiere of me and my shadow is approaching with alarming / exciting speed. Enghien-les-Bains is getting ready for the Bains Numeriques festival, with banners appearing on the streets and everything. The festival looks great I must say – lots of fantastic stuff. Very nice to see our posters next to Carl Craig’s in the cda windows. Unfortunately I’ll miss him playing in the middle of the lake after our premiere because I’ll be in London – the problem with doing a four-way telematic project is that you can’t be in four places at once (although me and my shadow might be the closest you can get). I’ve made a new page with details of the premiere on the 9th June, and details of the installations running from the 10th – 26th. You can find it here. 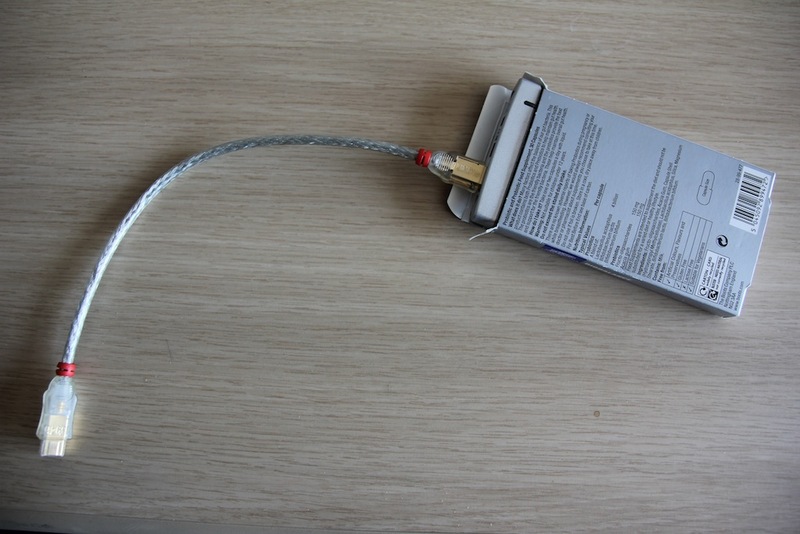 I had a not-so-fun distraction at the weekend – my laptop died, completely, on Sunday. Impeccable timing, as it always is with such things – not only is this two weeks before the me and my shadow premiere, it was a Bank Holiday weekend. Absolutely EVERYTHING was shut, not only in Enghien but in Paris too – even the Apple Store. Despite this, I managed to score the right tools to open up my MacBook Pro, borrow another one, bodge together an ‘enclosure’ for my drive, boot from it and keep on working – I was quite impressed with my resourcefulness, and the kindness of strangers..
I’m now working with my drive – ie my life, and all the me and my shadow sounds, in a cardboard box. A little bit scary. Don’t worry, I did back up! 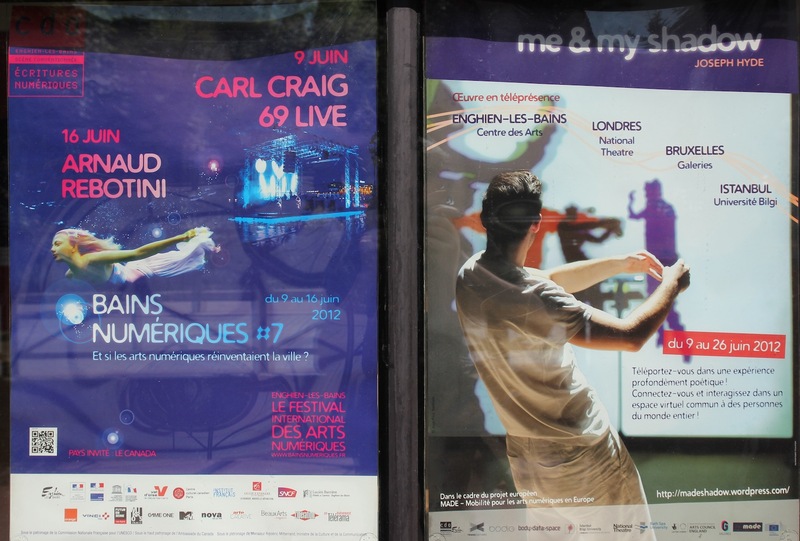 Enghien-les-Bains – the final residency! 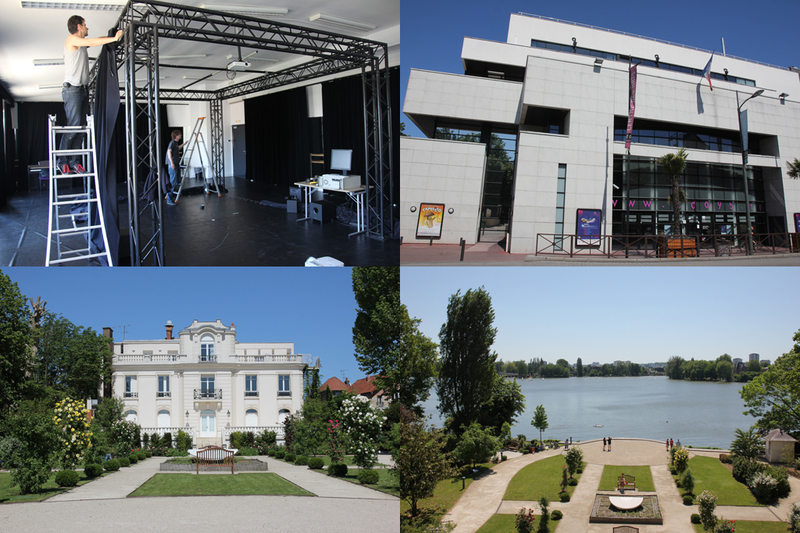 So here we are in Enghien-les-Bains, at the Centre des Arts (top right, above). We’re currently in the dance studio, where they’ve built us a prototype portal (top left, in progress) pending construction of the final portal in the foyer next week. All looks very promising and exciting! Enghien is a beautiful spa resort – it’s in the north of Paris surrounded by fairly rough areas, but feels like a village. We’re staying in the Villa du Lac, which is as nice as it sounds. Can’t complain I must admit – I’m in that room at the top, and that’s my view! The first few days will be fairly quiet as it’s the bank holiday weekend (and looks set to be a sunny one), but I’ll post more here next week..